Heritage crochet riding gloves feature a cotton mesh top and a genuine leather palm. They are an ideal all around crochet glove for schooling or pleasure. Comfortable custom fit and leather palm construction. 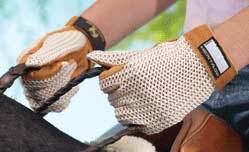 The elastic cuff and adjustable strap closure securely hold the gloves on your hands. Genuine leather palm, which allows you to have a soft and natural grip of the reins. Glove top is made with a soft cotton mesh for total ventilation, allowing perspiration out and fresh air in. We have included our patent pending "Rein Cut" design between the ring and pinky fingers. This unique design removes the bulky seam and materials between your fingers to allow you to flex your fingers unrestricted and comfortably while maintaining sensitivity and control of your reins. This area is also reinforced with a second layer of protection against wear. Double leather on the top of the index finger and tip of thumb for protection against wear. Heritage Gloves exclusive ID label allows the gloves to be personally identified by the rider. Heritage Gloves are official Riding Gloves of the United States Equestrian Federation.